BogoSort also known as permutation sort, stupid sort, slow sort, shotgun sort or monkey sort is a particularly ineffective algorithm based on generate and test paradigm. The algorithm successively generates permutations of its input until it finds one that is sorted. Bogosort is an algorithm used as a demonstration of the least effective approach to sort a list of values. The Bogosort is only a theoretical concept, which has no use in practical applications. So let’s see a concrete illustration. 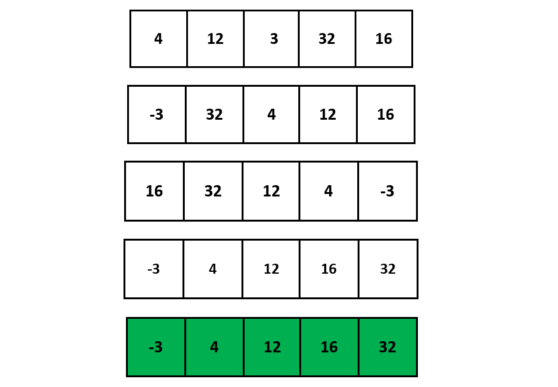 We have 5 integers we want to sort with bogo sort. We generate random permutations of the integers. How many possible permutations are there? For 5 numbers, there are 5! permutations. So in worst case scenario, we have to consider all of the 120 possible solutions. Let’ take a look at the implementation. As you may guess it is quite easy to implement bogo sort in kotlin. We have a one-dimensional array we want to sort. So we keep generating new permutations with the shuffle() method. The only problematic part of the code is the shuffle method. Here we use Fisher-Yates algorithm to do so. Let’s take a look at the implementation of this approach. OK, so we have come to the conclusion that it is very slow algorithm. Why are we talking about it? Because it is a good example to highlight the difference between classical and quantuum computers. This highly inefficient algorithm proves to be a very good algorithm on quantuum computers because of entanglement. Quantuum entanglement will enable us to check the permutations simultaneously instead of checking one after another sequentially. So on quantuum computers, bogo sort will have O(1) running time!